Once known as the wickedest little city in America, Dodge City attracted a passel of colorful characters during its heyday, including Wyatt Earp, Doc Holliday and Bat Masterson. And thanks to its location on the Great Western Cattle Trail, Dodge City was also a prime stop for thousands of cattle every year. In modern times the town’s wild west history hasn’t been forgotten either; in fact it was subsequently brought to life in 1955 when James Arness played Marshall Matt Dillon in Hollywood’s depiction of an 1870s Dodge City on Gunsmoke. Today, the gunslingers and outlaws have departed, but a definitive western charm still prevails in this cattle drive boomtown. 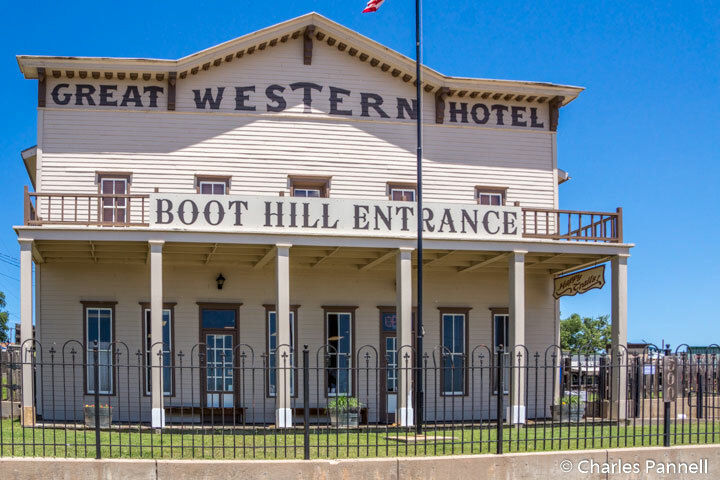 And although the 1870s version of Dodge City was far from wheelchair-accessible, wheelchair-users and slow walkers can now enjoy a little taste of the wild west in this restored Kansas cowtown. 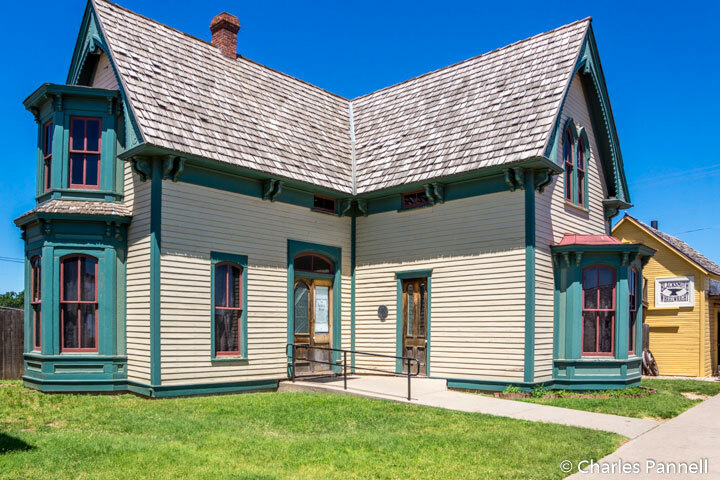 The best way to begin a historic Dodge City visit is to stop at the Visitor Information Center, located at 400 West Wyatt Earp Boulevard, near the intersection of 3rd Avenue. There’s plenty of accessible parking in the large lot adjacent to the center, with level access over to the building. Inside, you’ll find a bevy of maps and brochures, along with a cadre of eager volunteers who can answer questions and offer advice about anything Dodge City related. The Visitor Information Center is also the place to purchase tickets for the Dodge City Trolley Tour. This one-hour narrated tour, which is available from Memorial Day to Labor Day, offers an excellent synopsis of Dodge City history, and gives visitors a good overview of the historic district. And best of the all, the trolley is lift-equipped, so everyone can join in on the fun. The tour passes by the cattle feedlots that surround ‘Dodge City, and includes a brief drive through Fort Dodge. 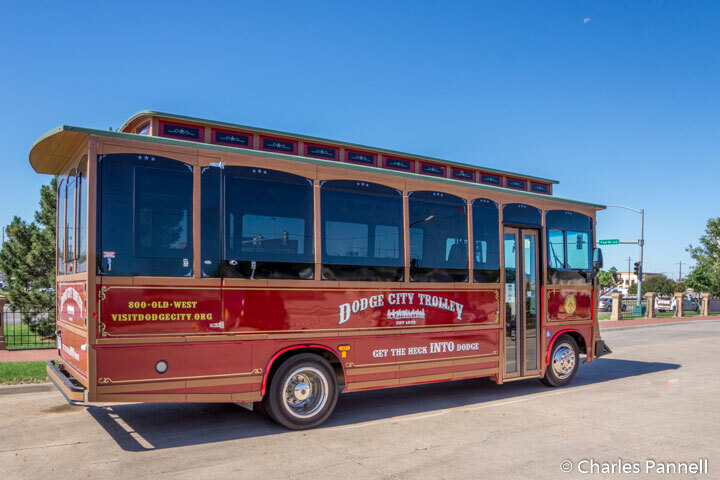 Once back in the historic district the trolley takes a trip back to 1870s Dodge City, as it passes along Gunsmoke Street and travels up Gospel Hill, before it heads back to Front Street and returns to the Visitor Information Center. Not only is this tour a great way to get your bearings, but it’s also very affordable at just $8 per person. The Boot Hill Museum (www.boothill.org) is also a Dodge City must-see. Located just a short walk from the Visitor Information Center on Front Street near 5th Avenue, this living history museum feature a replica of 1870s Front Street, and includes more than 60,000 historic artifacts, documents and photographs. Set on the site of the original cemetery, the graves were relocated when the museum was developed. Accessible parking is located in front of the museum, with level access over to the museum entrance at the Great Western Hotel. Steps lead up to the main entrance, but let the staff know if you can’t manage them, and they will open the level side entrance. From there an accessible pathway leads over to the back of the Great Western Hotel, where’s there’s level access to the gift shop. Inside, visitors are treated to a movie about Dodge City and its legendary law men in the barrier-free theater. Outside, a cement pathway leads from the Great Western Hotel, past the Fort Dodge Jail to the Boot Hill Building, which houses the “People of the Plains” exhibit. There’s a slight cross slope on the cement pathway, so some manual wheelchair-users may require a bit of assistance in this area. Inside there’s barrier-free access around the exhibits, which include artifacts from the Comanche, Apache, Kiowa, Arapaho and Cheyenne people; as well as exhibits about Fort Dodge, the railroad, and the Santa Fe Trail. Accessible restrooms are located in this building; and there’s also ramp access to the northwest corner of the original cemetery behind the building. There’s level or ramp access to most areas of the restored storefronts along Front Street, which are located in front of the Boot Hill Building. This section of the museum features recreated businesses that were once located along Front Street, including a dry goods store, a barber shop, a drug store, a saddlery, a boot shop, a bank and a print shop. The businesses contain artifacts from people who lived and worked in Dodge City in the 1870s; and although most of the area is barrier-free, there is a slight step up to the print shop and the bank. And don’t miss the Charles Rath & Company General Store – which has items for purchase as well as historic displays – and the legendary Long Branch Saloon. Outside there’s ramp access up to the old Superior Schoolhouse, which was built in 1915. This model is typical of the one-room schoolhouses that dotted the Kansas prairie in the early 1900s. And don’t miss Union Church, which also features ramp access. Wyatt Earp and Bat Masterson were deacons of this church, and many historians believe that the construction of this building marked the beginning of the taming of this wild and wooly town. Be sure and head outside as the noon hour approaches, as you don’t want to miss the daily gunfight put on by the Boot Hill Gunfighters. It may not be the real thing, but it certainly is entertaining. Last but not least, save some time for a walking tour of old Dodge City. For the most part the streets that run east to west – including Front Street and Gunsmoke Street — are fairly level; however the northeastern section of the historic district may be a bit too steep for most wheelchair-users and slow walkers. Be sure and pick up a walking tour brochure at the Visitor Information Center, which maps out the Dodge City Trail of Fame (www.dodgecitytrailoffame.org). This trail is marked with sidewalk medallions and statues which commemorate real and fictional Dodge City characters. Highlights of the trail include plaques about Doc Holliday and his love interest Kate Elder (Big Nose), Wyatt Earp, Bat Masterson, George Armstrong Custer, Dennis Weaver (who got his start on Gunsmoke), and of course James Arness. The majority of the medallions are located along Front and Gunsmoke Streets, which makes for a nice level walk. The Santa Fe Depot, which is located at the end of Front Street is also worth a stop. Built in 1897, it once housed a Harvey House and an employee dormitory; however today it serves solely as an Amtrak passenger depot. There’s level access to the building, and you can even get a peek at the Harvey House Lobby, which is usually locked. Save some time to stroll along 2nd Avenue, where you’ll find a nice collection of historic buildings. At the top of the list is the Carnegie Center for the Arts, which is located on Spruce Street and 2nd Avenue. Built in 1907, the building formerly served as the Andrew Carnegie Library, but it’s now home to the Dodge City Arts Council. Although the building is currently closed to the public, it’s listed on the National Register, and the decidedly Midwestern architecture is definitely worth a look. Don’t miss the Bank of America building, located right across the street. 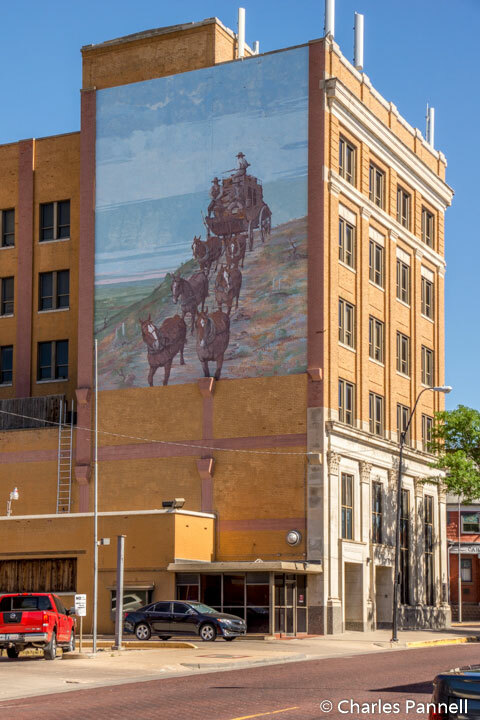 Although the five-story building was considered a skyscraper in the 1930s, the Stan Herd mural on the side of the building is the real show stopper. Patterned after Frederick Remington’s “The Old Stagecoach of the Plains,” it’s a striking piece of public art. Finally, when you’re ready to hit the road, drive up to the Sacred Heart Cathedral, located on Gospel Hill near Central Avenue and Cedar Street. This mission-style church features level access and is open to the public. Also on the National Register, the current building — which replaced the catholic church built in 1882 — was constructed in 1916. The carved limestone entry is impressive, but don’t miss the George Melville altar mural and the Emil Frei stained glass windows. The church is definitely a sight to behold and it makes a fitting finale to any historic Dodge City visit. ‹ Sleeping in Dodge City	› Do You Need Travel Insurance?